Are you – or do you know – someone who likes to travel with pets? Perhaps you’re also looking for a more convenient and sanitary way to provide refreshment for your beloved animals while on the road. If so, Nutmeg Animal Welfare can help, with our new foldable food and water bowls! 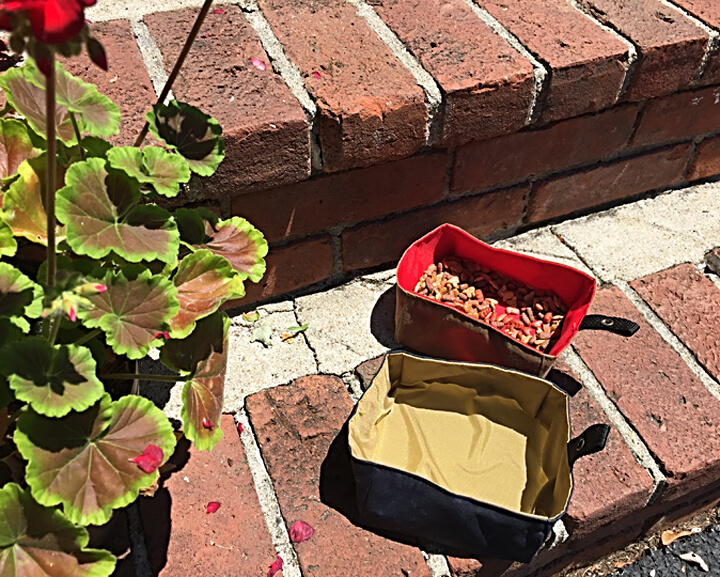 Designed with animal-loving travelers in mind, these square bowls are large enough to hold substantial amounts of food or water, yet fold up flat to a small-enough size that can easily fit in most jacket and pants pockets. 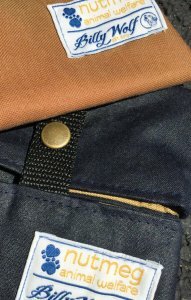 Made of lightweight brushed canvas on the outside, with waxed canvas on the inside, our bowls snap shut and can easily be packed away in backpacks or suitcases without taking up much space. After use, our leak-free travel bowls are quickly and easily cleaned. Just use regular dishwashing soap and water, or wipe down with a clean, wet paper towel. Let dry on their own, or dry them right away yourself, and they’re ready to reuse over and over again! We can make this claim with certainty, as we’ve spent the past two years testing the bowls in our travels. 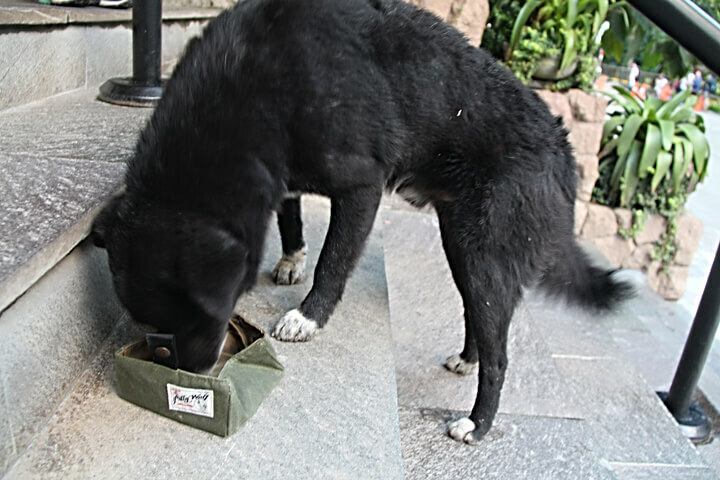 Suitable for dogs, cats, or other pets of various sizes, these travel bowls have also been used by Nutmeg Animal Welfare to provide immediate relief to hungry and thirsty strays on the streets of Ireland and Peru. We never go anywhere now without them, as they are perfect for spontaneous acts of kindness whenever we encounter homeless animals. 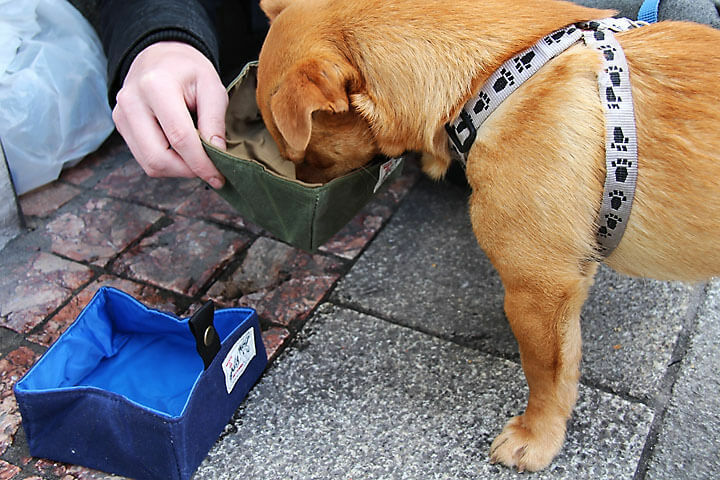 We know you’ll find them equally valuable no matter where or when you travel with your own pets. 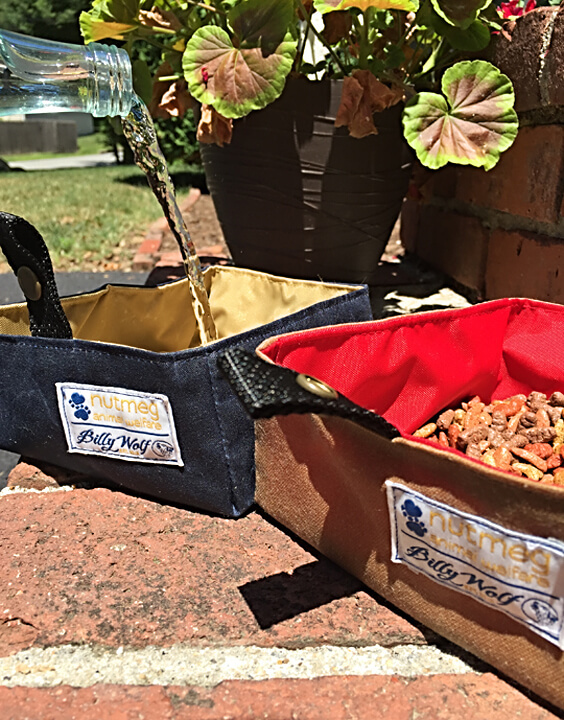 Nutmeg’s foldable travel bowls come in two stylish colors: navy with tan interior and field tan with red interior. 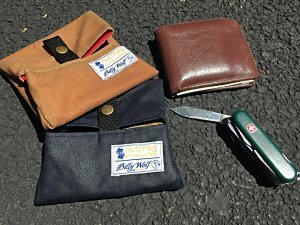 We ask for a $40 donation for each pair. Consider mixing your pair by getting one of each color so you always know which is for food and which for water (although they can always be used interchangeably, of course). To purchase, please make a donation in the required amount on www.nutmeg.global (see order form below). For orders of five pairs or more, multiple the number of pairs by $40 and enter the total amount manually. Then, please indicate the colors you’d like and we’ll ship right away to your billing address. If you’d like shipment to an alternate address, please contact us with that information. Nutmeg is delighted to introduce this first product featuring our official logo, alongside that of our manufacturer and partner organization, Billy Wolf NYC of Long Island. Your purchase of Nutmeg’s branded travel bowls helps support our ever-expanding efforts to care for needy animals everywhere on Earth. *We will mail your travel food/water bowls to the billing address.